Scrap Delicious Designs: Sneak Peeks - September Classes! Sneak Peeks - September Classes! ****no sample for this one yet! The paper is coming in this week - so I will post as soon as I have the sample ready! *******It is a Sketchy Recipe! 2:30 - 4:30 pm - Cost: $15. 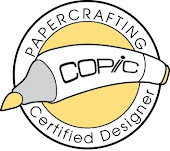 Copic Christmas Part 1 - 2 classes available for this one - Thursday September 20th 10 -2 pm and Saturday September 29th 10-2 pm Cost for this class is $25! I just love these kids from LaLa Land Stamps!